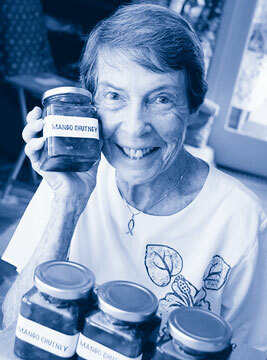 Every year, Alice Yoder supervises the making of mango chutney for the First Presbyterian Church of Honolulu's bazaar. "I've said this is my last year, but I've been saying that for five years, I think." At First Presbyterian Church of Honolulu, the chutney maven is Alice Yoder, who has been overseeing the mango chutney production line since 1988. The jars of homemade chutney go on sale at the church's 30th annual bazaar, 9 a.m. to 2 p.m. Saturday at Ko'olau Golf Club. Yoder says she and her team of peelers, cutters, cookers and jar-sterilizers has put up about 150 8-ounce jars, based on a recipe that has probably been in use since the bazaar was founded. It came from the late Mary Young, a baker for the Alexander Young Hotel and a charter member of the church. "Mango was scarce this year," Yoder said, "but we were very fortunate. A lady called. She wanted her tree all picked. We picked and picked." Peel and cut mangoes in pieces. Combine sugar and vinegar in a saucepan; bring to a boil for 5 minutes. Add remaining ingredients and cook slowly about 1-1/2 hours, until thick and mangoes are transparent, stirring frequently with a wooden spoon. Seal in 8-ounce sterilized jars. Makes 12 to 15 jars.